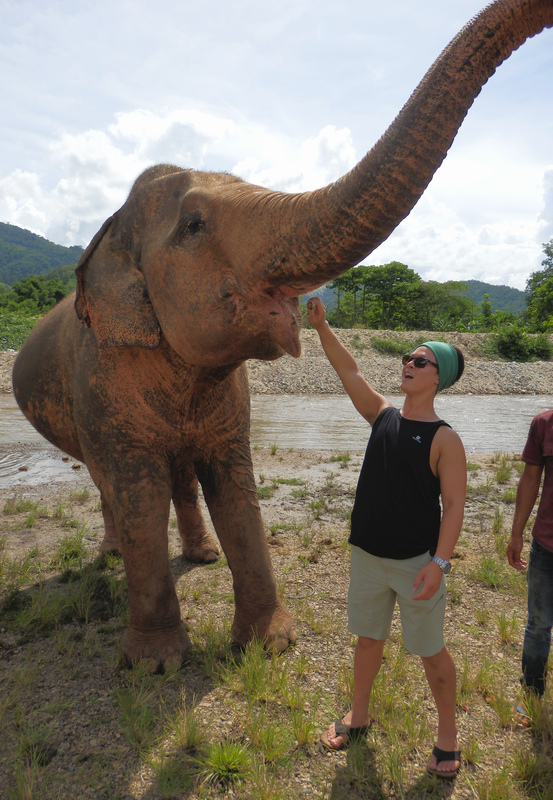 When I was researching Chiang Mai and all the things we could do there, one thing that stood out was the one day volunteer experience at Elephant Nature Park. This is our experience. When we arrive at the park, the first order of business is to start with feeding. there are giant basketfuls of squashes, bananas, and other fruits and vegetables. We grab chunks and bunches of bananas and reach out to them, and they reach back with the immense intricacy of their trunks to grab the food and put it in their mouths. The whole idea is surreal, feeding such massive animals that would otherwise see you as a threat if they were in the wild. But here, they were gentle beasts eager to interact with people. Perhaps it’s because these animals were domesticated in a sense (I use this term very loosely) and have thus far had negative interactions with humans. Perhaps the more positive interaction of feeding and smiles was more welcome for them. 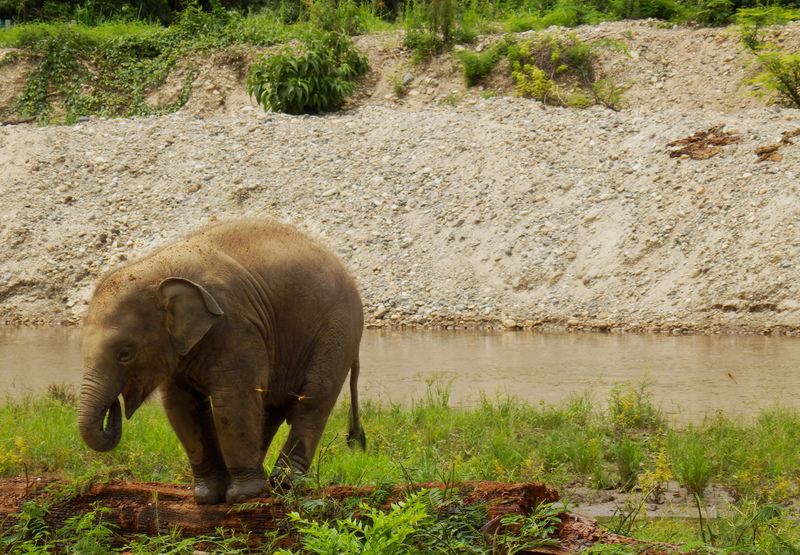 Now elephants eat tons (quite literally), and our baskets of food don’t really cut it. This is just the morning feeding, the first of many to come. 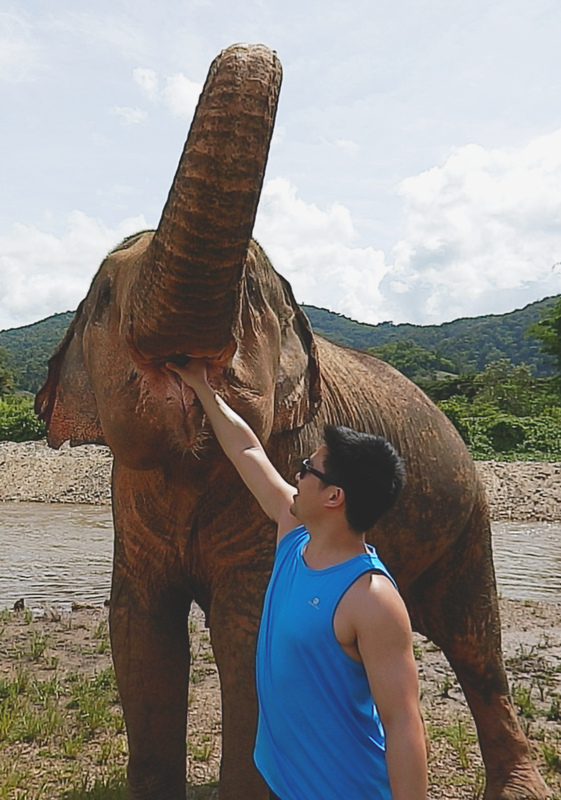 However, giving the volunteers an opportunity to feed these magnificent animals and interact with them in a relatively safe way gives them (at least it gave us) a great deal of appreciation for their plight. Forget single bananas, these ladies eat them by the bunch! 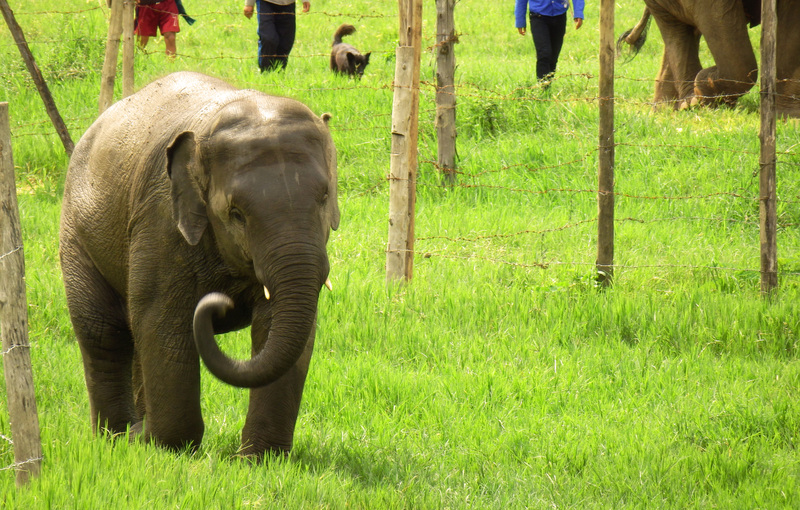 We continued to walk around the park and see the elephants roam around eating grass and occasionally bathing. There is no elephant riding in this park since they believe it is not a necessary skill for the elephants to have for their health. I imagine that whales kept in captivity learn to open mouths on command so trainers can administer medicines, making it a necessary skill. Having a human on your back didn’t seem like it was essential in any way for their health and well being. 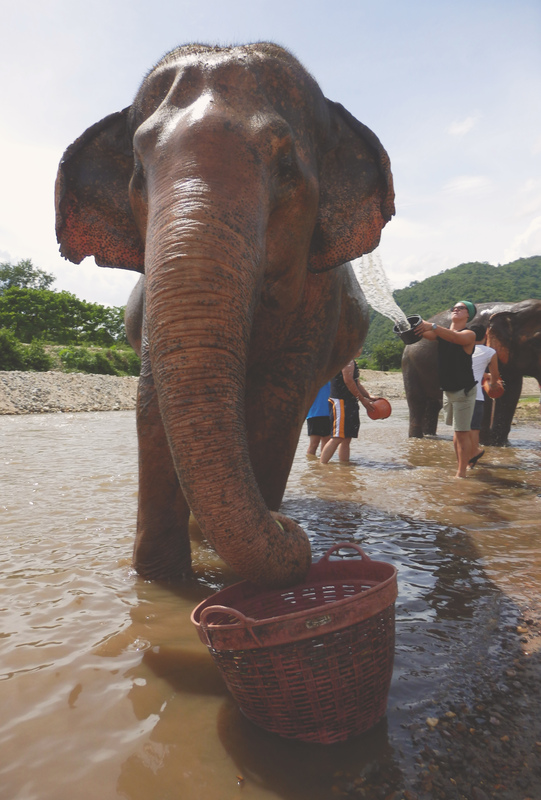 Each elephant has a handler, or mahout. 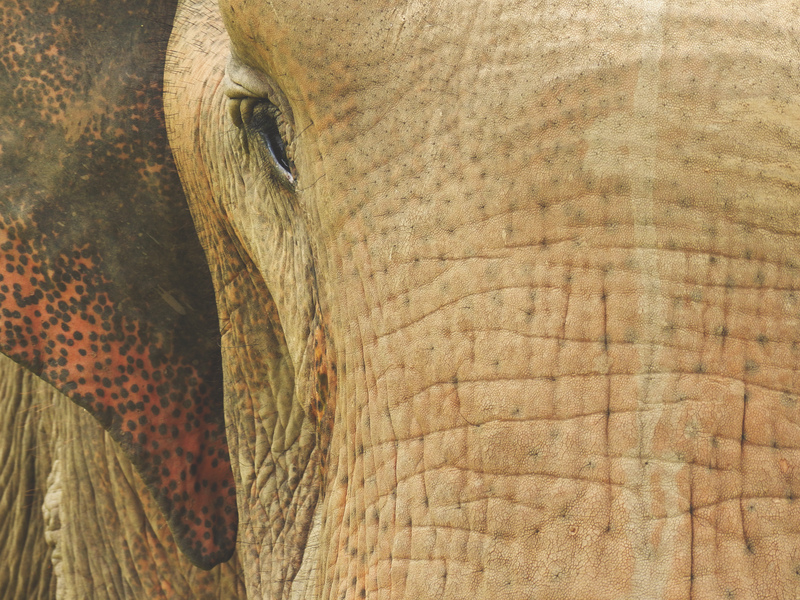 The relationship between an elephant and their mahout is intimate, but not necessarily mutually beneficial. The mahouts at the park refrained from riding (I’m not sure if they actually ride them) the elephants while we were there and it was their job to take care of their assigned elephant. It didn’t seem like we did much but really, just being in the presence of such massive animals and touching them was quite exhilarating itself! This little guy was the cutest! The plight of the elephants in SEA was on my mind throughout the morning. 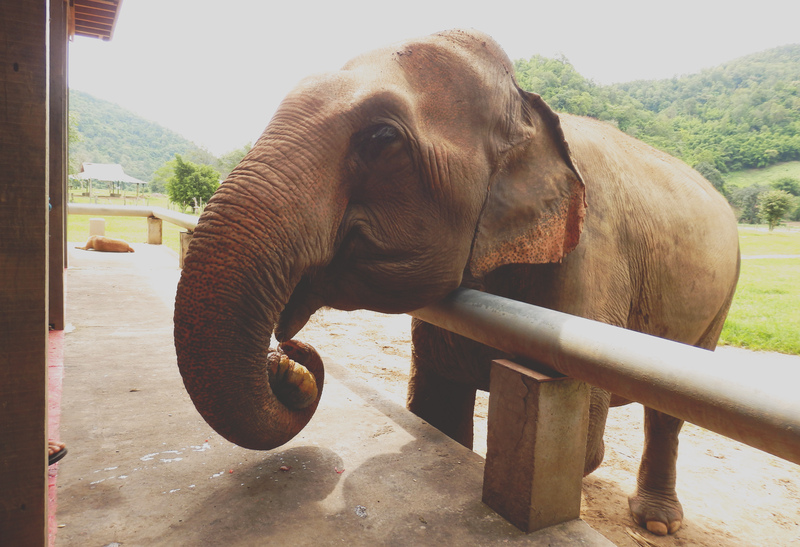 During lunch, we talked with the other volunteers about their experience with elephants in their travels. 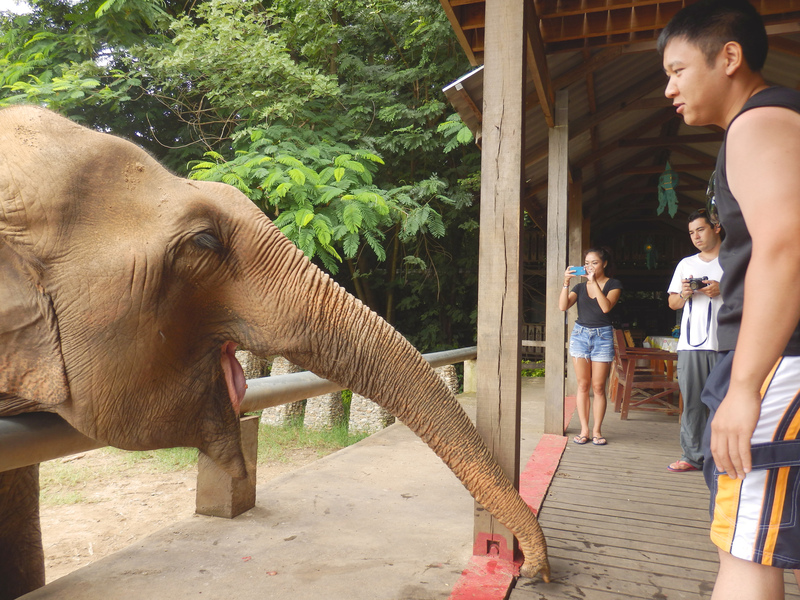 One American couple came from Phuket a few weeks earlier and they said they saw elephants roaming the streets, with mahouts selling bananas to tourists so they could feed it. They said the elephant looked visibly frightened, and for good reason. 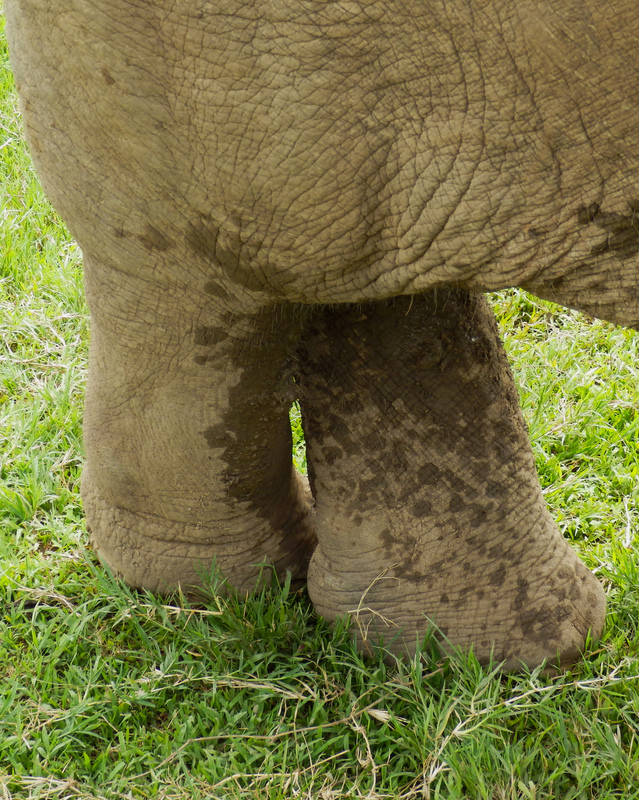 Elephants’ foot anatomy basically puts them on their tippy toes permanently and they sense vibrations from the ground as part of their sensory input. In a jungle or grassland is one thing, but the vibrations it was getting from the city sounds, pavement, cars etc must have been extremely overwhelming. 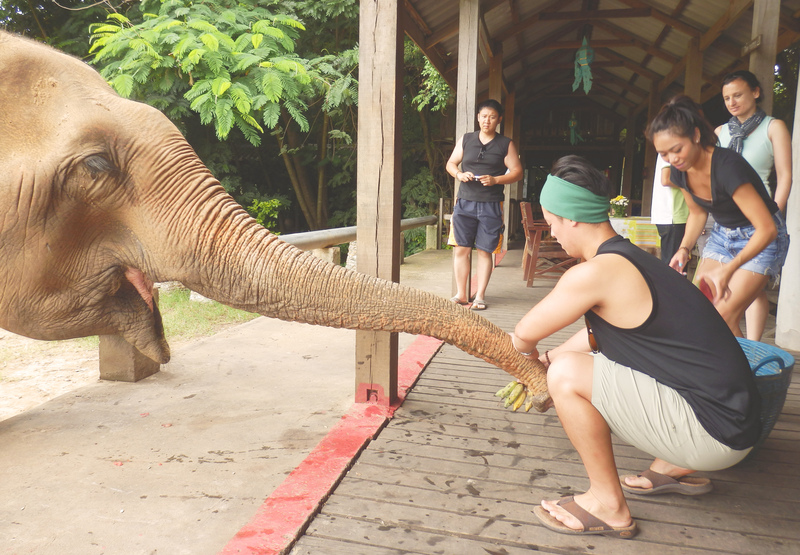 Another couple unknowingly went on an elephant riding tour and saw its handler use a mallet hammer on its head to get it to move. Absolutely atrocious. 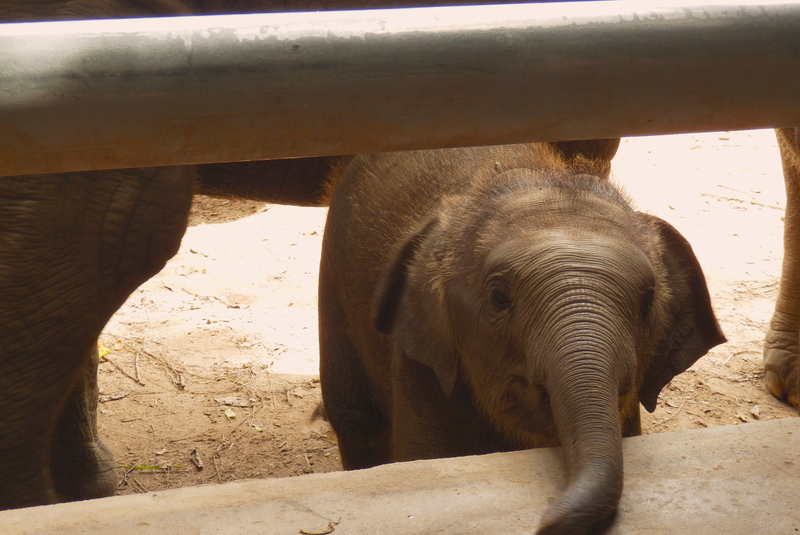 Young elephants like this are paraded in busy cities for profit. To get a more complete picture of the elephants’ plight, we watched a gut wrenching video after lunch. 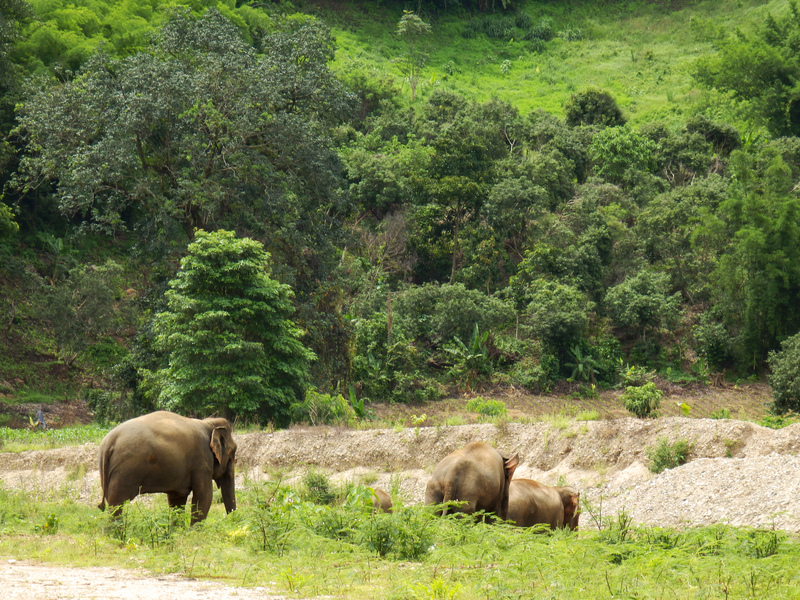 Elephants in SEA are regularly used in the lumber industry in Thai, Burmese and Laotian forests. Elephants bred for labour are separated from their mothers weeks after birth, caged in an enclosure just enough to fit the baby, and prodded with sharp stakes until they break into submission. This is done repeatedly, and while they are not being prodded, they are chained to a tree away from their mother. One elephant (I believe her name was Jokia) was pregnant during her time in the labour camps, but had a miscarriage due to extreme working conditions not suitable for a pregnant elephant. When the depression took over and she refused to work, her mahout took a slingshot to both her eyes, blinding her permanently. 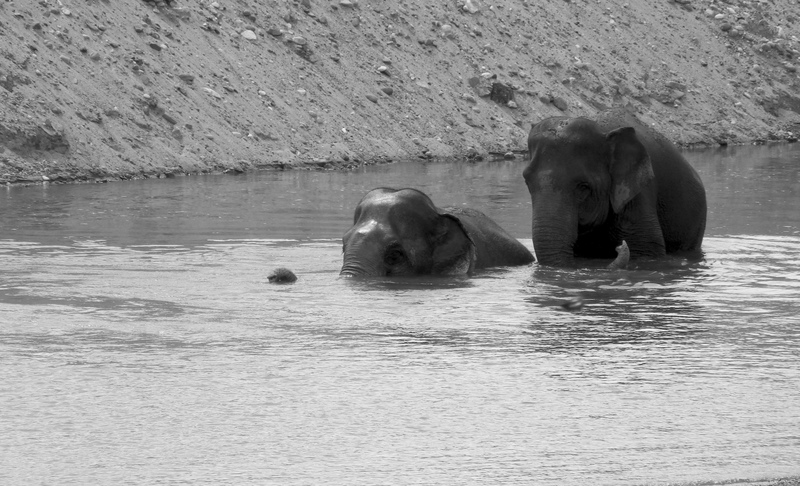 This was visible in many of the elephants we saw today. 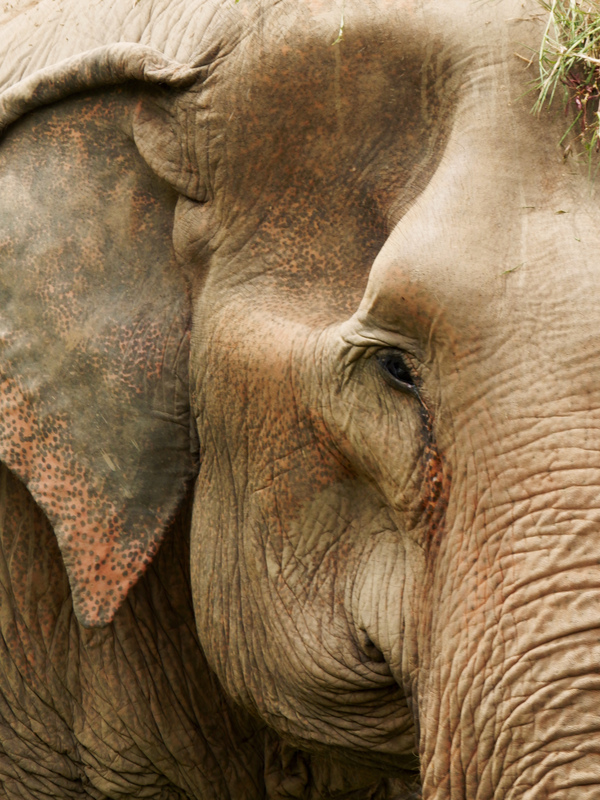 They weren’t pristine, captivity bred elephants, but weathered, old, rescued animals. Many walked with a limp, or had permanent hip deformities from labour related injuries that weren’t treated properly. 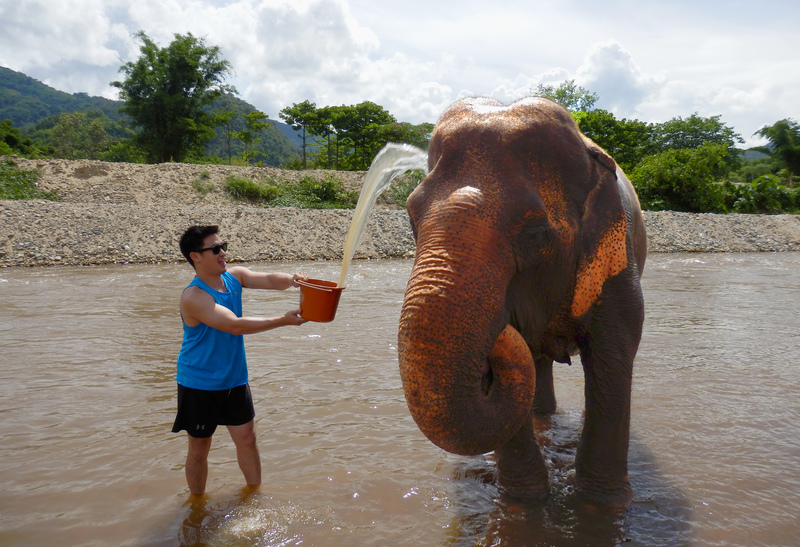 To lighten the mood, we finish off helping the elephants bathe in the nearby river by splashing buckets of water on their backs. They seem to really enjoy cooling off here during he afternoon sun. around 3pm, we jump back on our van and get taken back to our hostel. This guy had a bad hip deformity from a poorly cared for injury. This experience really got me thinking about the nature of animals in captivity. On one hand, ENP rescuing elephants from atrocious working conditions and giving them the care they need in the park facilities. These elephants are messed up both physically and psychologically when they are rescued and they are indeed in need or rescue. At the same time, these are wild animals and having such intimate interactions with them is definitely not natural. I guess a bunch of nature fanatics might say this is not a good thing they are doing, but the way I see it, these particular elephants have been semi domesticated already. They have been working for humans all their lives and to say that they are truly wild would be an inaccurate statement. Certainly, it is not wise to try to feed a wild elephant, but these are not truly wild elephants anymore. Left to the wild, they might be recaptured, or just succumb to their injuries. To put it quite frankly, they are “damaged”. Certainly this doesn’t mean they don’t deserve care and love, but rehabilitation into the wild is not an option anymore. 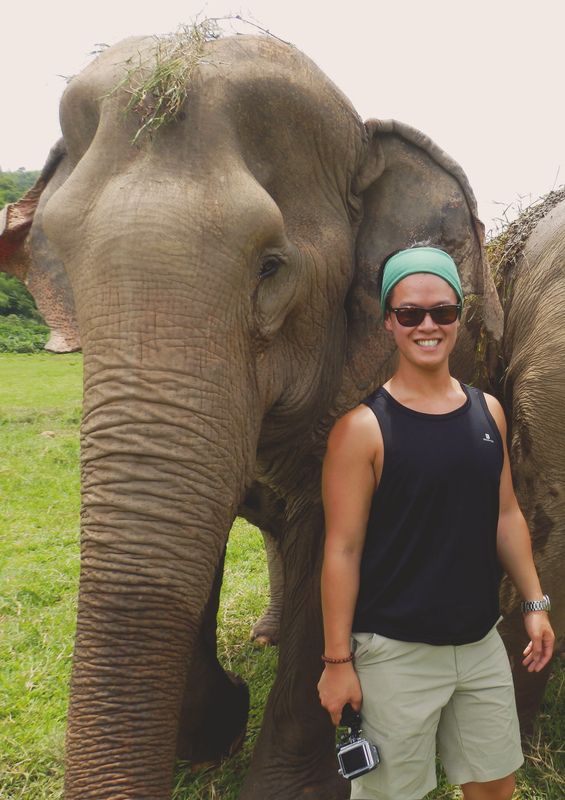 By living out the rest of their days in EHP, they get care, food, and they serve to educate tourists about the reality of elephant riding and elephants in general in SEA. I sense certain parallels can be drawn with the Vancouver Aquarium’s marine rescue program. You be the judge. It’s our job as travelers to be informed about the decisions we make so that we have a positive effect on the local community. Who wouldn’t want to come visit this guy? If you love elephants (who doesn’t?! 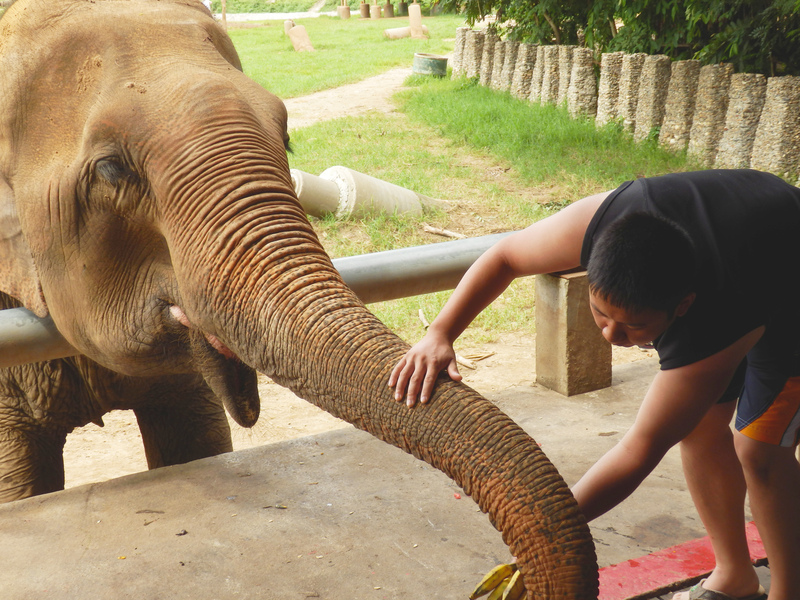 ), and are visiting Chiang Mai, Consider visiting EHP for a day to get an up close experience with these magnificent creatures. You won’t get to ride them, or jump on their backs while you wash them, but what you will do is learn about them and the hardships they have gone through. 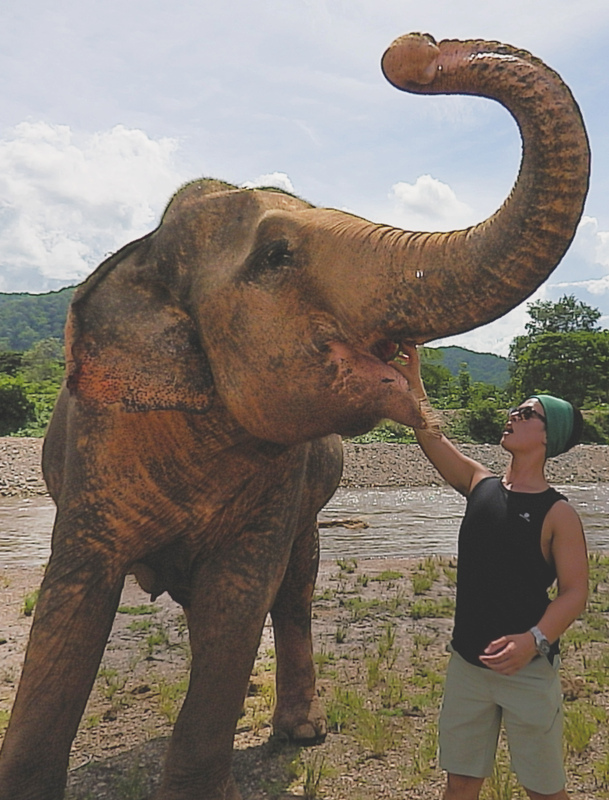 If you are thinking of joining any elephant experience (or wildlife experience for that matter) during your travels, I implore you to do your research and be ethical about the travel choices you make. As travelers we can be a force for good by demanding ethical practices, but that starts with being an informed traveler. Besides, I don’t think any right minded person would want to see the animal they are riding on get beat on the head with a mallet right? Old Chiang Mai, Meet New Chiang Mai!